Last year I needed to find zen or I would die. My muscles were in such knots at the end of the school year my chiropractor prescribed regular massages, hot baths, and as many vacations as I could manage. I went to New Hampshire. Here I am again. 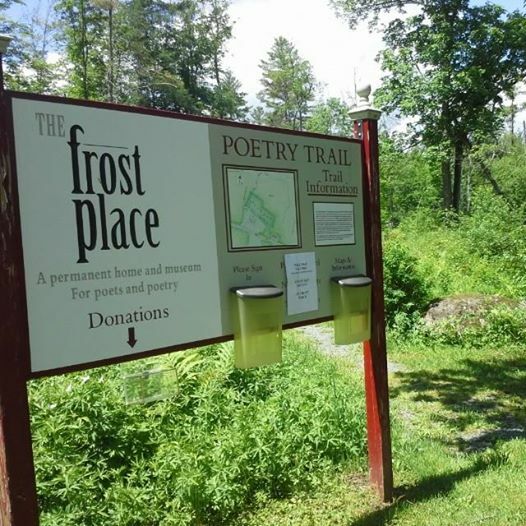 This time I am at the Conference on Poetry and Teaching at the Frost Place in Franconia, a tiny little place where the air is clear and the nights are darker than I’ve experienced in a long time. This conference is different: Only 14 participants this year. All focused on the art of poetry. Some are working poets. Most are working teachers. I heard about this conference on a Twitter chat, and since my return trip to the UNH Literacy Institute, which was already planned, happened to be on the calendar for next week, the stars aligned. I find myself here, staying at a gorgeous bed and breakfast listening to rain fall gently on the old but sturdy roof. It is day four, and I’ve learned more about poetry and poets and revision and analysis than I learned in all the classes leading up to my degree in literature. Oh, to give this kind of learning to my students! 1. Guest poet workshops. Iain Hailey Pollock visited first. He shared lessons from his classroom, his experiences as a writer, and the most engaging Poetry Death Match, a contest with one poem survivor. That evening Iain read his work. If you are not familiar with his poetry, order the collection Spit Back a Boy immediately. Next, Meg Kearney, poet and author of two YA novels in verse: The Secret of Me and The Girl in the Mirror, taught some creative writing activities with a selection of extended metaphor poems, and we wrote our own (or tried.) Meg read a piece she’d been asked to write about her evolution/revolution as a poet, which stung my heart — her hope and search for her birth mother, her raven dreams. So beautiful and haunting. When she read that evening my heart was on fire. I know why people fall in love with poems and poets. like a mouse with the soul of a bull moose. I present tomorrow. Before I came I was nervous. Poetry was never my thing. Now, I am confident. A community can do that to a person. 3. (Although I haven’t done it yet) Each participant was challenged, just short of pressured, to read a poem tonight at the evening reading. Talk about scary and intimidating. The director Dawn Potter is a working poet. Read her poems and you will see why my knees are already shaking. Her collection of poems is Same Old Story. You will want to own it. And Teresa Carson’s My Crooked House, too. Teresa read on Sunday. Encouraged and inspired by Teresa and Dawn’s work, and Meg’s awesome poem “Creed,” I wrote my own that I will share tonight. It’s modeled after Meg’s in form, but I only lifted three of her lines. make me weak, indulgent, brazen, or fat. is a blessing of the good life unless they live too far away. everything is easier. Do you know He loves you? Do you know His son? an earthlife away, I knew the spirit goes on living. tornado. I believe I will miss my mother every day of my life. wholeness of a mother’s love and the completeness in my marriage. I have fallen in love with poetry. You, dear reader, should meet me at this conference at the Frost Place next year. Simply amazing. ← Are you Part of a Writing Project? I love your poem, Amy, for it’s honesty and depth. You shared what is in your soul with us with courage. Keep writing. You have a gift. I haven’t written poetry for a long time, but this inspires me to begin again. Thank you. That poem is beautiful, Amy. I’m so glad you get to go up to New Hamshire again to rejuvinate and learn. I love hearing your voice in the poem and that you were confident and strong in sharing your beliefs about God and family. Thanks so much for sharing this experience with us! What powerful words, thoughts, images. I can see you resting easy in poetry – it suits you. Intellectual, open, deep, provocative, personal, heartfelt, reflective, creative. Yes, poetry suits you my friend.